Included in this Feedmill Automation System is the control and automation of Batching, Grinding, Material Receiving, Truck Scale and Loadout processes. Two (2) desktop PC’s are provided. One runs the Batching and Grinding systems, the other runs the Truck Scale and Receiving systems. The overall Feedmill automation incorporates ingredient and formula destination checks to ensure ingredients and formulas are not cross contaminated while grinding and transferring occurs. Standard batching features are included, such as the multi-tasking capability that allows the system to batch while editing or checking formulas, formula production/inventory, ingredients, ingredient inventory/usage and other main menu functions. The system automates bin feeders, scales, mixing and discharge from the mixer. Finished feed bin levels are also monitored by the system in order to automatically control the finished feed elevator and distributor. 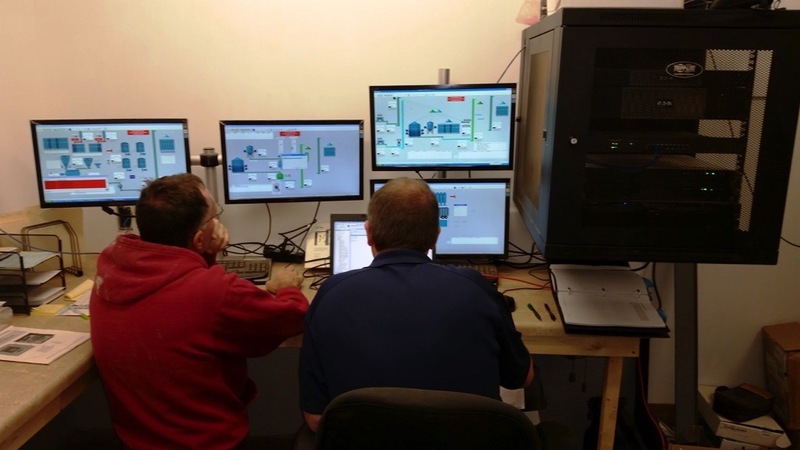 To make the Feedmill Automation System even more complete and comprehensive Sterling Systems & Controls, Inc. includes its WebCentral remote supervisory application software. This allows the automation system to be accessed remotely through a web browser for any corporate computers that are connected to the same local area network as the automation system computers. The capability is provided to edit formulations, bin tables, and view and print historical data in the database without interrupting production and without requiring additional software to be installed on the corporate computers.